LOEW: Germany will need to step up their game for the quarter-finals against France. PORTO ALEGRE: Joachim Loew insists Germany must improve for Friday's World Cup quarter-final against France after a below-par performance in their 2-1 extra-time win over Algeria in the last 16. Late goals by Andre Schuerrle and Mesut Ozil sealed victory in Porto Alegre on Monday to put three-time winners Germany into the last eight. Didier Deschamps' France lie in wait at Rio de Janeiro's Maracana stadium, but Loew says his side must remedy their poor finishing and defensive errors against Algeria. 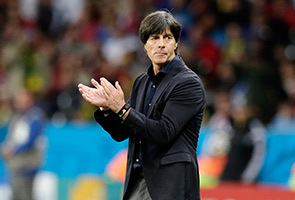 "We must be better for the match against the French," admitted the 54-year-old Germany head coach. "Today was a victory of the will. "During the first half we were poor, we gave away a lot of ball, which invited Algeria to counter-attack us." Chelsea winger Schuerrle put the Germans ahead with a deft 92nd-minute flick to reward his impressive display off the bench after replacing the ineffective Mario Goetze at half-time. "We'd have prefered to win in 90 minutes, but the Algerians did a good job," said Schuerrle. "We don't care how we did it, the main thing is we're in the quarter-finals." Loew revealed Germany's right-back Shkodran Mustafi is set to miss the rest of the tournament after suffering a hamstring injury. But Germany's midfield general Bastian Schweinsteiger should be fit despite limping off in extra-time. "Mustafi did a great job, but he's pulled a muscle and I don't think he will play a further role in this tournament," said Loew. "Schweinsteiger just had cramps at the end, he was just empty after the 90 minutes, but he isn't injured." Loew also singled out Germany goalkeeper Manuel Neuer for an impressive display to repeatedly thwart Algeria's attacks until Abdelmoumene Djabou claimed a late consolation goal. "Neuer had an extraordinary game, he didn't just have to pull off a lot of saves, but he kept cutting out their long passes into his area and dealt well with them," said Loew. "He came out a lot and had a great save right at the end when Algeria were desperate for a goal." The Maracana clash will be a mouth-watering showdown between two of European football's powerhouses. It stirs memories of the 1982 World Cup semi-final which finished in a dramatic 3-3 draw before West Germany went through after their 5-4 win in the penalty shoot-out. "I wouldn't want to talk about France-Germany in 1982, but those have always been dramatic classics between the team," said Loew. "Didier Deschamps has turned them around since 2010, they have good players like (Karim) Benzema and (Olivier) Giroud who can decide games on their own. "We're looking forward to another classic."